Sea anemones are remarkable creatures. They are a group of water-dwelling, predatory animals, but if you look at them, they look like plants more than animals. Now, a team of evolutionary biologists from the University of Vienna has discovered that sea anemones display a remarkable genome, featuring a complexity of regulatory elements similar to that of fruit flies and, more distantly, other animal model systems. However, sea anemones are more similar to plants rather than vertebrates or insects when it comes to regulation of gene expression – which makes them quite the remarkable mixture. The way our body looks and the way it works is (taking environmental factors into consideration) largely a result of our genes. But genes aren’t what you’d call “single players” – they work in tandem with each other – if I may, much like the singers in an orchestra. They regulate each other’s activity and expression in gene regulatory networks. This implies (at a very simple level) that complex differences can’t be explained merely by the absence or presence of a certain gene; it’s not just the existence of genes, but how they interact, how they “network” with each other. Accordingly, researchers expected that these gene networks are less complex in simple organisms than in human or “higher” animals. With the aid of a sophisticated molecular approach called chromatin immunoprecipitation, Hertha-Firnberg-fellow Michaela Schwaiger, member of Technau’s team, was able to identify promoters and enhancers (they network regulators) on a genome-wide level in the sea anemone. These were then compared to regulatory landscapes of more complex and higher model organisms. 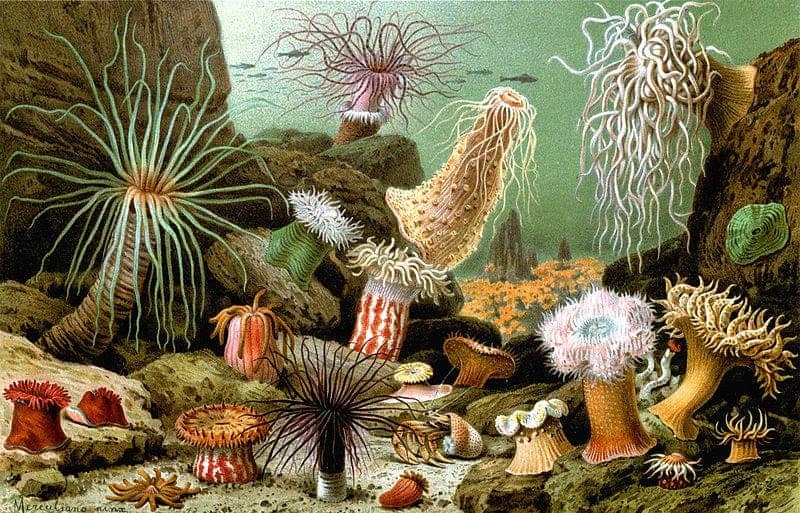 “Since the sea anemone shows a complex landscape of gene regulatory elements similar to the fruit fly or other model animals, we believe that this principle of complex gene regulation was already present in the common ancestor of human, fly and sea anemone some 600 million years ago” , Michaela Schwaiger states. To sum what they found, the sea anemone’s genome, gene repertoire and gene regulation on the DNA level is surprisingly similar to vertebrates – for an animal that is basically stuck to the bottom of the sea floor, that’s truly remarkable. But on the other hand, post-transcriptional regulation is much like that of a plant, probably dating back hundreds of millions of years, when animals and plants originally split up. This is the first qualitative difference found between anemones and other, “higher” animals, and it provides valuable insight into how important levels of gene regulation can evolve independently. However, it also raises even more questions about how gene regulation works and evolves, as this research area is rather in its infancy.